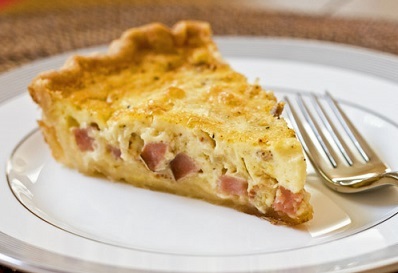 Of the many kinds of Quiche the restaurant serves, this restaurant breakfast recipe is still a favorite of the restaurant customers, including "real men." Preparation time: approximately 25 minutes. Serves 4. Add chopped sautéed onion on top of bacon. Add dash of nutmeg to cream-egg mixture. A wonderful tasting meal as a result of a wonderful and favorite restaurant recipe. Thank you for visiting. ENJOY the restaurant breakfast recipe and the company of those you share it with! Did you know? 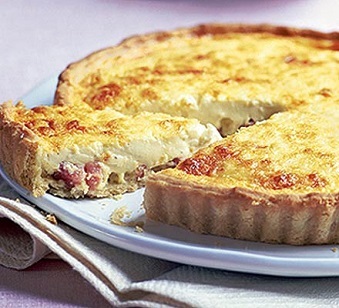 Quiche is considered a classic French dish, however custards in pastry were known in English cuisine at least as early as the 14th century. 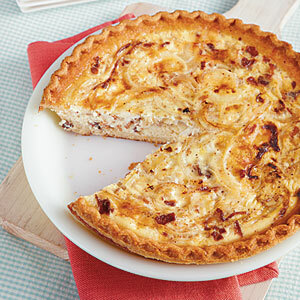 The original ‘quiche Lorraine’ was an open pie with a filling consisting of an egg and cream custard with bacon. It was only later that cheese was added to the quiche Lorraine.